Chocolate Banana will help you to MAXIMISE WEIGHT LOSS! Designed to help maximise your weight loss when used alongside diet & exercise. BURN STUBBORN FAT: Using Chocolate Banana can help you shift fat from stubborn areas that are difficult to impact with diet alone. ACHIEVE A TONED & SCULPTED LOOK: Because Chocolate Banana ingredients help you maintain a healthy metabolism, they help you lose fat and achieve better muscle definition. Chocolate Banana stimulates weight loss by working to energise your metabolism whilst at the same time helping to lower your cravings for food. The revolutionary ingredient which has been used for 1000’s of years in Brazil, combines the appetite suppressing powder associated with Hoodia with a boost to your energy levels to help to keep you energised throughout your busy day. 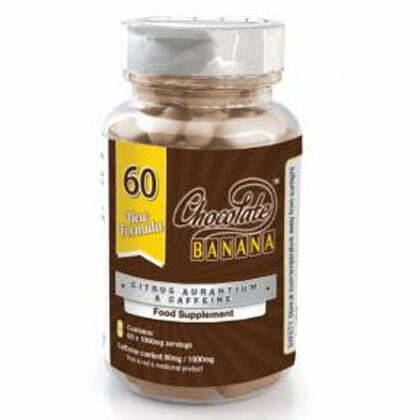 Chocolate Banana Original Slimming Tablets are energy boosting weight loss supplements. Not only does Chocolate Banana suppress your appetite, helping to curb hunger cravings during the day but it also helps to burn more calories due to the energy boost. Chocolate Banana will help you to eliminate fatigue and increase your energy levels…fast! Leaving you much more energetic, productive and vibrant in a short period of time. It helps you to stay alert and boost your energy levels while also helping you to lose weight. • Chocolate Banana will help you to MAXIMISE WEIGHT LOSS! • Designed to help maximise your weight loss when used alongside diet & exercise. ChocolateBanana stimulates weight loss by working to energise your metabolism whilst at the same time helping to lower your cravings for food. The revolutionary ingredient which has been used for 1000’s of years in Brazil, combines the appetite suppressing powder associated with Hoodia with a boost to your energy levels to help to keep you energised throughout your busy day.